It's the start of a new weekend, and the regulars gather at the downtown Red Dragon Chinese restaurant to wash away the workweek with domestic pitchers and dollar-off well drinks. Some order chow mein or sweet and sour pork with sticky rice, providing a base for the alcohol. The booths and tables are packed, and there's an electricity to this red upholstered backroom — aptly called the Red Lantern Room — with patrons of all stripes buzzing around the bar top and pool tables waiting for 5:30 pm to hit. Then the belly dancing will begin. From behind a velvet curtain in the back of the room, the first dancer enters in blue satin and sparkles. She glides to the front of the room and hands the DJ next to the stage her music. Once the sultry rhythms begin, she starts to sway on the raised platform. Some in the audience look away from the performer who proudly moves her exposed belly. Some show no emotion while watching, and still others stare intently, as if wondering how the woman is able to isolate her stomach muscles with such efficiency. The people who come here every Friday know what to expect as the dancers perform one at a time, and they have their fresh dollar bills (and more) to tip all of the performers tonight as they make moves to exit the room. If you're not careful, dancers may make you get up and shake along with them, too. Some older men and women eagerly enjoy this prospect more than others. Next is Stephanie McMechan, dancing mostly in yellow sequins. People clap along with her Middle Eastern music and hip shimmies. She wraps herself in a long yellow scarf and somehow spins out of it. A jokester shooting pool pretends to play his cue like a flute along with her song's melodies. "She makes me want to get up and dance, too," says Yolanda Anderson, moving her hips and raising up her arms in the back of the room. Anderson, who usually takes care of her ailing mother, comes to watch whenever she can. There was a time that she considered learning how to dance, but stage fright keeps her on the ground. "I do need to get some of those finger cymbals [known as zills] for home, though," she laughs, clicking her fingers together. Tonight, all of the local dancers are paid professionals (there also are amateur nights). Although not every woman's tummy is the exact replica of a Sports Illustrated swimsuit model's, this doesn't inhibit movement or confidence on stage in any way. Namva Chan, owner of the Red Dragon and a belly dancer herself, brought the shows to the location to give her dance company another opportunity to perform and bring the tradition to a wider audience. 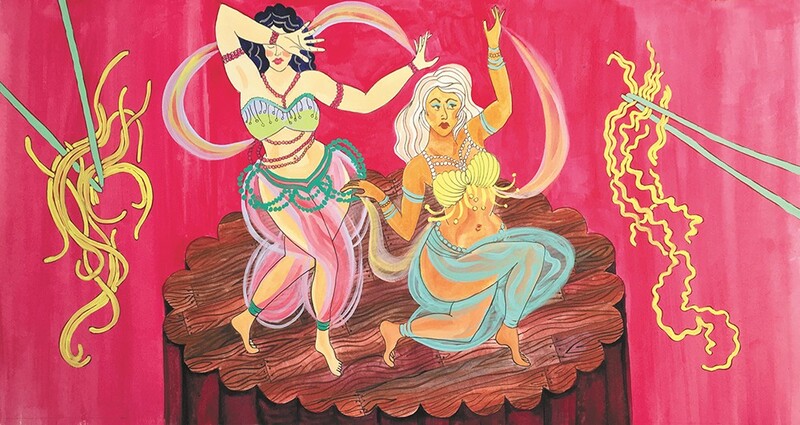 While Chinese restaurants don't normally host the Middle Eastern style of dance — as one may expect from a Greek place like Azar's Restaurant, which also offers belly dancing on Fridays — dancers have performed in this space for more than three years. The customers come back week after week for more. Omar Updike, a tanned cowboy, wraps his arms around Stephanie McMechan after her set; she now looks completely different in glasses and street clothes. "Stephanie, you're the star," he says bashfully. She thanks him and smiles kindly. McMechan, who has been belly dancing professionally since 1987 and also teaches, describes herself as a lifer. She says she couldn't quit if she tried.